Have you ever dreamed of having sleek, straight hair? With a Revlon flat iron, keeping your locks smooth and straight is easy. Revlon hair straighteners protect your hair during styling, giving you the healthy-looking hair you desire. Whether you want to transform your natural waves into a new straight look or simply banish frizz to make sure you look neat at all times, a Revlon flat iron can produce beautiful results. Revlon flat irons use ceramic plates to gently straighten your hair. The plates quickly heat up, reaching the right temperature for styling in as little as 30 seconds. Then it automatically shuts off when the correct temperature has been reached. Heat sensors continuously monitor the temperature of the plates in order to keep them at a constant temperature. The heat is spread evenly through each ceramic plate, allowing them to heat your hair evenly. The plates clamp together firmly to ensure that every strand is included. Not every style requires the same level of heat. When you use a Revlon flat iron, you can choose the heat setting that is right for your hair and the look you want to create. Simply choose the right heat setting and turn on the flat iron; an indicator light will show that the iron is heating up. When this light goes out, the flat iron is ready to use. Thanks to the different heat settings, it's a flexible tool that can help you achieve many attractive hair styles. To keep your Revlon flat iron working at its best, you need to clean the plates regularly. The ceramic plates of a Revlon flat iron are easy to clean. First, unplug the flat iron and leave it to cool until it is only warm, rather than hot. Wipe down the ceramic plates with a damp cloth. Then leave the flat iron to dry before you use it again. Cleaning your Revlon flat iron regularly will help to prevent hair products and natural hair oils from building up on the plates, allowing them to effectively heat and straighten your hair every day. 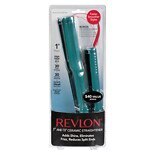 Consider a Revlon flat iron as part of your hair care and beauty routine.